WTI crude prices have collapsed to just above $43/b this morning. 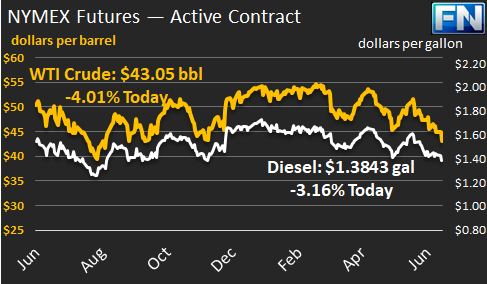 Prices weakened yesterday, closing at $44.20/b. WTI opened at $44.11/b today, a drop of $0.57, or 1.28%, below yesterday’s opening price. Prices dove again in overnight and early morning trading. Current prices are $43.05/b, a significant drop of $1.15 from yesterday’s closing price. WTI prices have not been this low since September 2016. Diesel opened at $1.4087/gallon this morning. This was a decrease of 1.45 cents (1.02%) below yesterday’s opening price. Current prices are $1.3843/gallon, down by another 2.68 cents from yesterday’s closing price. Gasoline opened at $1.4486/gallon today, a drop of 0.37 cents, or 0.25%, from yesterday’s opening. Prices are $1.4222/gallon currently, down by 2.84 cents from yesterday’s close. For the last two weeks, weak demand and the renewed flow of oil into storage brought prices sharply down. Traders may be anticipating another week with stockpile additions and weak demand, and already are betting against higher prices as the current monthly contract expires later today. The market will watch closely for this week’s inventory and demand data. Crude oil prices are also being pressured down by increased output from Libya. Bloomberg reported that Libyan crude output has risen to 900 kbpd currently, after averaging 656 kbpd during the first quarter of the year. Libya’s goal is to expand production to approximately 1100 kbpd by August. The EIA has released data on gasoline and diesel retail prices for the week ended June 19th. 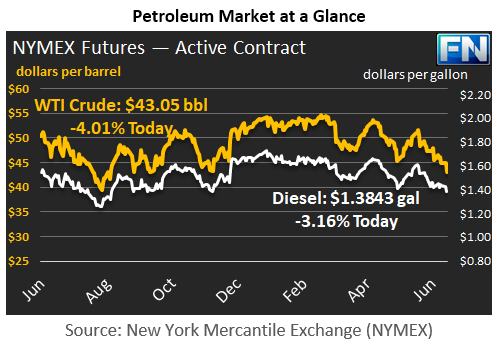 Crude prices have descended for four weeks running, and product prices have followed crude down. This current week, gasoline and diesel retail prices fell significantly at the national average level, and dropped in all five PADDs. Gasoline retail prices fell by 4.8 cents/gallon. Diesel prices dropped by 3.5 cents/gallon. Gasoline pump prices averaged $2.318/gallon during the week, 3.5 cents per gallon below last year’s price for the same week. Diesel prices averaged $2.489/gallon, 6.3 cents per gallon above last year’s price. The decline in gasoline prices has been particularly noteworthy. During the week ended June 12th, gasoline prices fell below their levels for the same week in 2016. During the most recent week ended June 19th, prices were 3.5 cents lower than for the same week in 2016. Until this month, year-2017 retail gasoline prices had been well above year-2016 prices. During the first quarter of 2017, retail gasoline prices were 44 cents per gallon higher than they were during the first quarter of 2016. The price convergence came as a great surprise to the market. Details are provided in our second article.